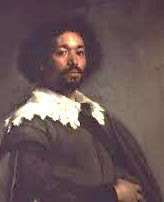 Born around 1480 in West Africa, Juan Garrido is the most prominent among the small group of African freeman who traveled to the Americas to take part in the Spanish conquest of the West Indies and Mexico in the late 15th and early 16th Centuries. He later became an agricultural innovator and is credited with introducing wheat harvesting to the Americas. After arriving in Lisbon, Portugal and becoming Christianized (c. 1495), Garrido traveled to the island of Santo Domingo. Although the record is conflicting, he probably accompanied a Spaniard by the name of Pedro Garrido, as a protégé or servant. By 1508, Juan Garrido was part of the Spanish auxiliary forces that helped invade and capture Puerto Rico and Cuba. His 1538 petitionary proof of merit to the Spanish Archivo General de Indias at Seville describes his 30 years of service to the Spanish Crown in various imperial conquests, including the pacification of the Caribbean Islands. By 1519, Garrido, a veteran conquistador, was a member of the Hernan Cortés’ expeditionary force that invaded Mexico and lay siege on the Aztec capital at Tenochtitlan. Having witnessed and survived the slaughter of Cortés’ troops in July of 1520, Garrido assisted in collecting dead bodies of Spanish soldiers and erecting a commemorative chapel near the site of the killings. For his service in the conquest of Mexico, Garrido was granted property on a dried out lake bed outside the former Aztec capital in 1522. Garrido became a farmer and was the first cultivator to harvest a wheat crop in the Americas. Along with cultivating grapes, Garrido’s wheat production was in direct response to the appetites of the growing number of Spanish secular and religious settlers in Mexico. Wheat bread played an important cultural role as a marker of elite social status. In 1523, Juan Garrido again took part in expeditionary exercises to explore the economic viability of the regions of Michoacan and Zacatula. He returned to Mexico City in 1524. While a resident of the new Spanish city, he was granted a house-plot and between 1524 and 1526 held posts of both doorkeeper (portero) of the city and protector of the capital’s main source of water, the Chapultepec aqueduct. Garrido was paid a sum of 50 pesos a year. By 1528, Garrido was following the gold rush to Zacatula province with a group of slaves and equipment. Finding little success, he returned to Mexico City the same year, in debt. Garrido’s fortunes took a turn, however, as he became part of the staff for Hernando Cortés’ expedition to Baja California (c.1533-c.1536). While hoping to find gold, pearls, and Amazons, Garrido and company encountered only poor weather and a disease-decimated native population. The expedition was a failure and Garrido returned to Mexico City. According to legal documents, the Garrido died in the capital sometime between 1547 and 1550, leaving behind a wife and three children. Peter Gerhard, “A Black Conquistador in Mexico,” Hispanic American Historical Review 58:3 (1978); Matthew Restall, “Black Conquistadors: Armed Africans in Early Spanish America,” The Americas 57:2 (October 2000).